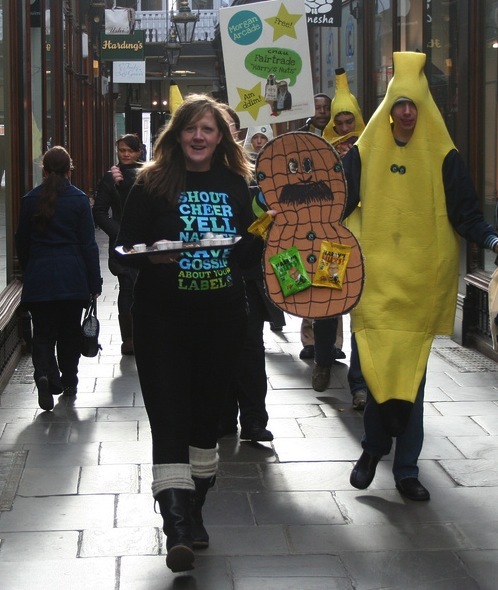 Go Bananas with the FIRST Fairtrade Nation! Today’s Go Bananas! guest blog is written by Elen Jones, the National Co-ordinator for Fair Trade Wales: the FIRST Fairtrade Nation! “So, what’s occurin’ in the 1st Fair Trade nation? I’m sitting here with my Fairtrade cuppa in hand thinking back to 2008 when Wales became the world’s 1st Fair Trade Nation. It was no mean feat; years of dedication and commitment, come rain or shine, doing the right thing. Volunteers up and down the nation, demanding a fairer deal, getting Fairtrade stocked in the shops, cafes and council offices. Uniting through a desire for trade justice, and a shared vision; a reason to come together, but a difficult, and at times lonely journey. Until of course, we were joined by Scotland last year! Huge congratulations to our fellow Celts, for going the extra mile. But what does it mean? It’s a wonderful transformative concept, of the meeting of hearts and minds from grassroots volunteers to government and everyone in-between, to ensure that what we buy from developing countries is traded fairly. 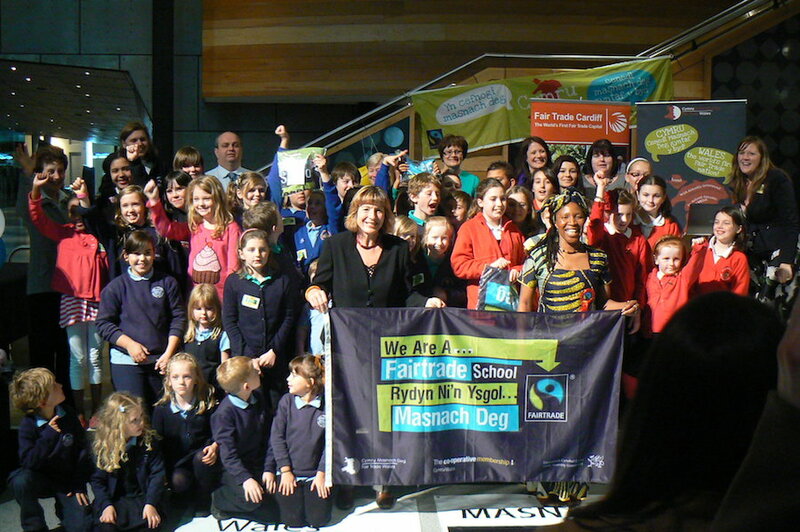 All tea, coffee and sugar in the welsh government and 82% of local authorities is Fairtrade. 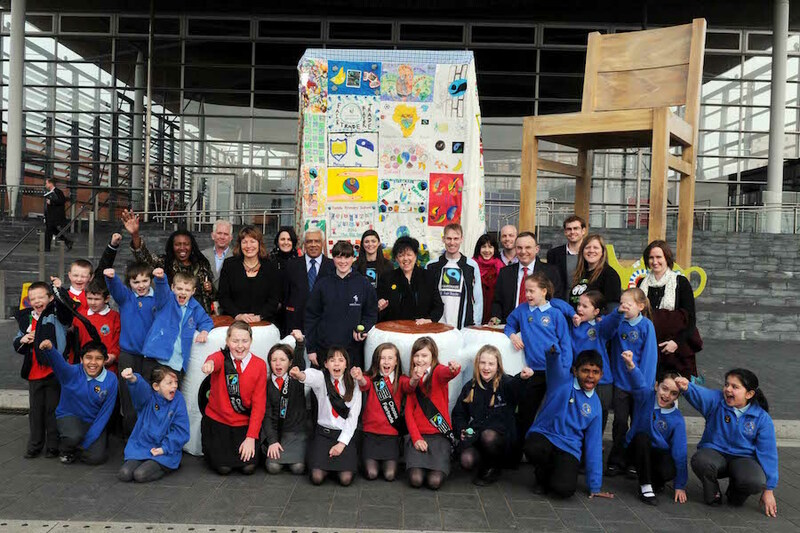 Every child in Wales gets the opportunity to learn about Fair Trade, and 65% are doing so, and nearly 50% of welsh towns are Fair Trade. How amazing is this? I do feel very proud to be living in a Fair Trade Nation where devolution has provided a fantastic opportunity for innovation and policies that pave the way for fairness, equality and equity. But there is so much more that can be done. I can assure you that Fair Trade Wales will be doing all that we can to ensure that the farmers voice is heard when Welsh Government passes legislation for Sustainable Development by 2015. It’s not right, that changes within the global trade industry, alongside intense retail competition in the UK has seen the price we pay for loose bananas slashed to unsustainable levels. The ripple effects across the supply chain of this race to the bottom have been disastrous for banana producers who shoulder most of the burden. Many plantation workers experience poverty-level wages, unacceptable working and living conditions, short-term contracts and trade union repression. At the same time, smallholder banana farmers have been forced to cope with these falling prices. They also face the impact of climate change and issues of food security and the reality that the cost of producing bananas sustainably has doubled in the past 10 years. The sums just don’t add up and without radical action to restore the value of bananas, the farmers and workers who produce the world’s most popular fruit will face increasing hardship. So, what can we do? You can Stick with Foncho and sign the petition here http://foncho.fairtrade.org.uk/ to tell Vince Cable, UK Business Secretary to investigate unfair supermarket pricing practices. The people of Wales have spent Fairtrade Fortnight at events up and down the country with 6 producers from countries like Ghana, Colombia and Palestine. Staff at the Welsh Government have joined in a Fair Trade Bake-Off, with Foncho himself as the judge! So, during Fairtrade fortnight, we will have been in good company. We are no longer lonely on our journey to a better world, fighting for greater trade justice for those upon whom we rely on every day. Come and join us.